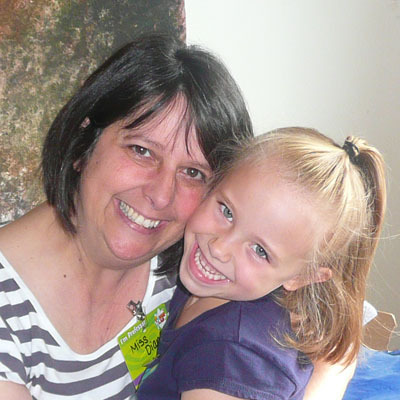 There are many great things going on for children at Elk Plain Community Church. Nursery - Nursery care is available during Sunday School and our 10:45 Worship service for infants - 3 years old. 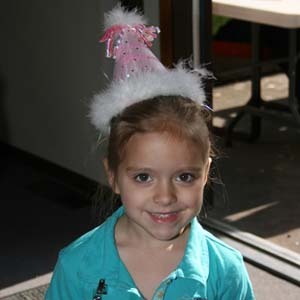 Sunday School - We have Sunday School classes for 3 year olds to adults. Classes meet Sunday mornings at 9:30 a.m. during the school year. Nursery for infants-3 is also available. Children's Church - Our 10:45 a.m. Sunday Church service includes a special message and activity for children in preschool through 6th grade. Nursery and preschool classes are available for the entire service. The rest of the children are dismissed just before the sermon, and are picked up after service. AWANA - Awana (Approved Workmen Are Not Ashamed) is an international ministry that helps churches and parents raise children and youth who know, love, and serve Christ! Our AWANA program meets during the school year on Wednesday evenings from 6:30 p.m. to 8:00 p.m. and includes classes for ages 3 years through high school. 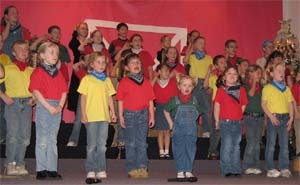 Children's Choir - Choir meets on Wednesday's from 5:30 p.m. to 6:30 p.m. between September and early December. Preschool - The church buildings are kept a buzz each week with preschool and kindergarten classes. 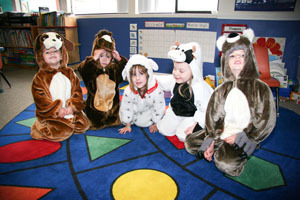 Visit our Preschool and Kindergarten page for more information. Vacation Bible School - VBS is held in late June Children from our community are invited to come and learn about God through music, skits, Bible stories, games, crafts, and verse memorization.